Hello! Welcome to my new blog. I shall update you all on the game I am working on as development progresses. Hopefully in a year or so I will have a fully functional game. Chances are, if you like any of the games mentioned above, my game will interest you. It will be a very old school sort of game, with good gameplay reigning supreme over graphics. Partly because a.) That's how it should be, and b.) I'm not that great of a sprite artist! The graphics I figure will look similar to old school Megaman games. The native resolution of the game will be 320x240 pixels. This will be able to be stretched to fit your screen, but yes, this will look very pixelated. This is so as to let the game look very old school, and also to ensure that I don't waste too much time working on graphics. However, there will be an option within the game to use the Scale2x algorithm on the game in order to make it look a bit smoother for the people that prefer that style. Currently, the player graphics have been finished. Take a look at the main character! The players will be able to customize the colors of all the parts of the character - shirt, pants, shoes, bandana, gun, shoulderpads, skin color, eye color, and lastly glove color. This will ensure that the players won't get lost among the other players during multiplayer mode. 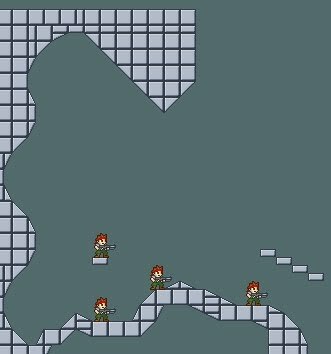 As you can see, the multiple tile types ensure that the level will be interesting and varied to run around. Some areas might not have any slopes, while some areas might have steep slopes, while some may be hilly areas with gradually curved land to traverse. Should keep the terrain fresh for the player and avoid monotonous level design. Anyhow, this is all I have to say for now! Check the site every so often for updates, and I'll see ya next time! Until then!